The panic attack that ravaged markets in the fourth quarter of last year, causing a 20% loss in the S&P 500 index, has almost completely reversed. Overseas equity markets have recovered as well; credit spreads are back to normal levels, the dollar is relatively stable, and commodity prices are up. What's changed to produce such a welcome result? For one, it's become increasingly likely that Trump will secure some sort of deal with China, thus reducing the threat of a global trade war. Second, while fears that the Fed would over-tighten turbo-charged the December panic, a more dovish Fed stance announced in early January helped sow the seeds of recovery. The bond market is now priced to no more tightening for the foreseeable future, based on an emerging consensus—apparently held by both the market and the Fed—that the US economy is going to be growing at a modest pace and inflation is going to average roughly 2%. 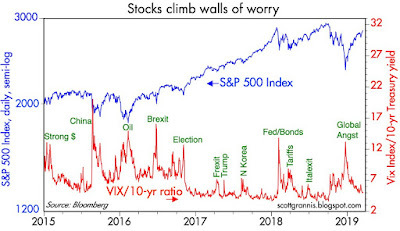 One important condition prevailed throughout this extraordinary panic attack: the economic and financial market fundamentals remained healthy. Fear and uncertainty are what's been holding the economy back. As a result, the economy has upside potential waiting in the wings. It still pays to be optimistic, since risk-free yields remain fairly low and the market is not priced to overly-optimistic assumptions. Chart #1 shows 2-yr swap spreads, arguably an important barometer of systemic risk and liquidity conditions, and at times a leading indicator of economic health. 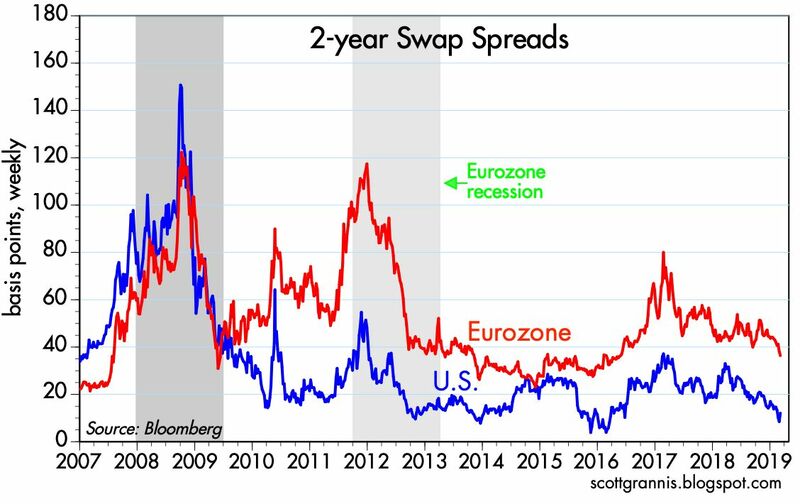 Today, US swap spreads are about as low as they get (which is very good), and in the Eurozone they recently have declined to levels (~36 bps) that are approaching the zone of normalcy. In the latter case that is grounds for optimism, given that spreads have been elevated for the better part of the past two years and the Eurozone economy has been struggling. Eurozone swap spreads are telling us that conditions may be about to take a turn for the better across the pond, notwithstanding the UK's inability to Brexit. 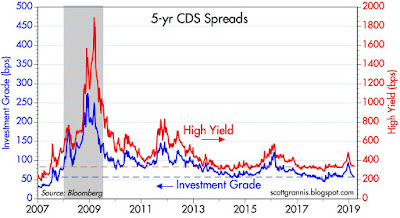 Chart #2 shows 5-yr Credit Default Swap spreads for generic investment grade and high-yield corporate debt. This is a liquid and timely proxy for the bond market's confidence in the outlook for corporate profits. Spreads have shed their year-end panic and returned to relatively low and stable levels. 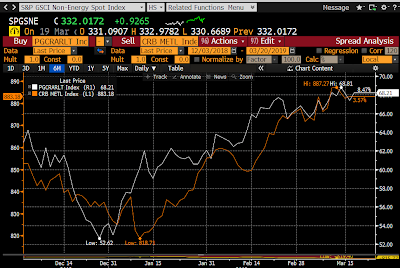 Taken together with the low level of swap spreads, the bond market is sending a positive signal about the underlying health of the financial market and the economy. Chart #3 shows two key measures of corporate profits. The blue line represents the trailing 12-month sum of reported earnings per share (adjusted for continuing operations), while the red line represents the quarterly annualized level of economy-wide corporate profits (adjusted for inventory valuation and capital consumption allowances, all derived from data reported to the IRS). The surge in profits which began a few years ago has been driven largely by the reduction in corporate tax rates. 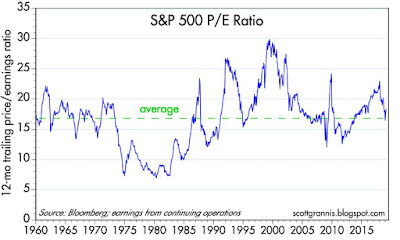 Chart #4 shows the PE ratio of the S&P 500. It's plunged from 23 early last year to now just under 19. The elevated PE ratios of early last year were the market's way of discounting an expected surge of profits resulting from reduced corporate tax pressures. Earnings per share are no longer surging, and PE ratios have settled back down to levels that are only modestly above average; in short, the boost from lower tax rates is now waning, and future growth in earnings will thus be largely organic. Currently the market expects earnings to grow at a 9-10% rate over the next few years—down from the 26.5% growth of earnings registered in the 12 months ending last November. Chart #5 shows the difference between the earnings yield (the inverse of the PE ratio, and equivalent to the dividend yield of the S&P 500 if corporations paid out all their earnings in the form of dividends) of the S&P 500 and the yield on 10-yr Treasuries. 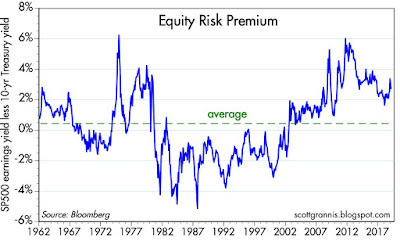 This is a proxy for the premium that investors demand to hold equities instead of Treasuries. 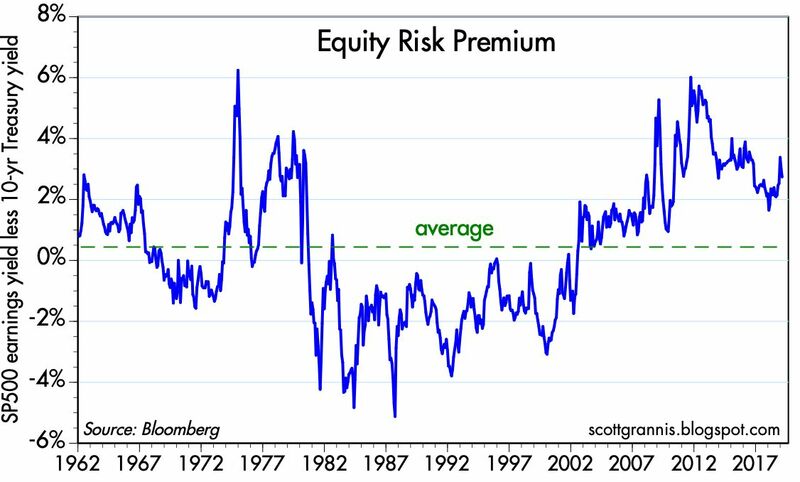 Over long periods this premium is close to zero, but today it is reminiscent of what we saw in the late 1970s, when the economy was burdened by slow growth, rising inflation, and a collapsing dollar. Yet today the fundamentals are much healthier. This can only mean that the market has little confidence in the ability of corporate profits to grow at an outsized pace—and by inference not much confidence in the economy's future health. Put another way, a lot of capital appears to be willing to give up a significant amount of (equity) yield in order to get the safety of T-bond yields, and that implies that risk aversion (and caution) is still alive and well. That further suggests that equities are not overpriced and could in fact be attractively priced, assuming one is optimistic about future economic growth being stronger than the market currently expects. Chart #6 is an update to a chart I've featured frequently. Here we see that the market's fears are dissipating and equity prices are regaining their prior levels. 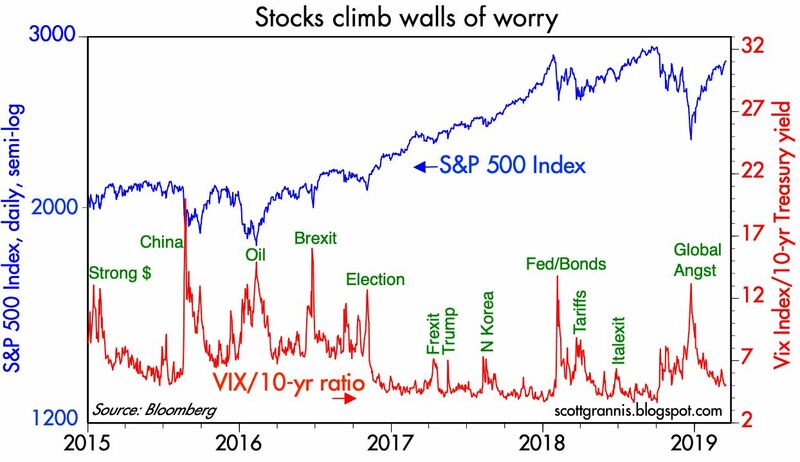 One more "wall of worry" is being overcome. 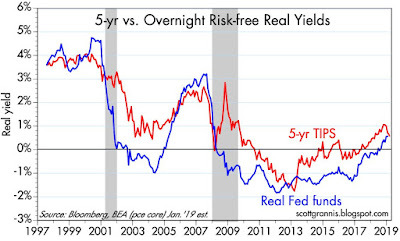 As Chart #7 shows, the big news on the interest rate front is the decline in real yields. 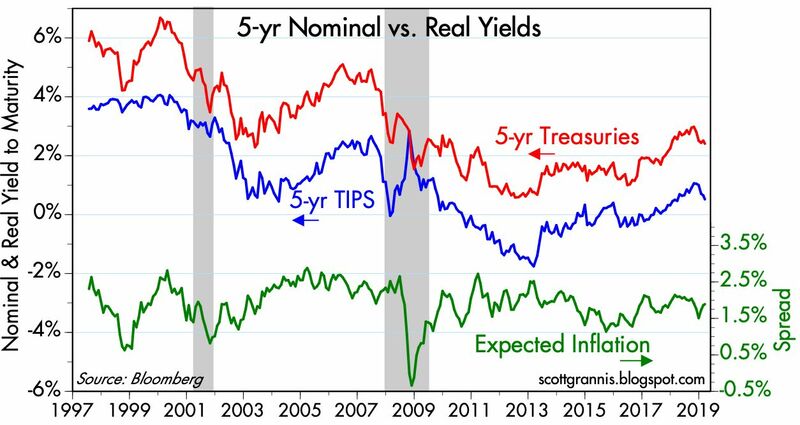 5-yr real yields on TIPS have fallen from a high of 116 bps in November (just before the market crashed in December), to now 52 bps. 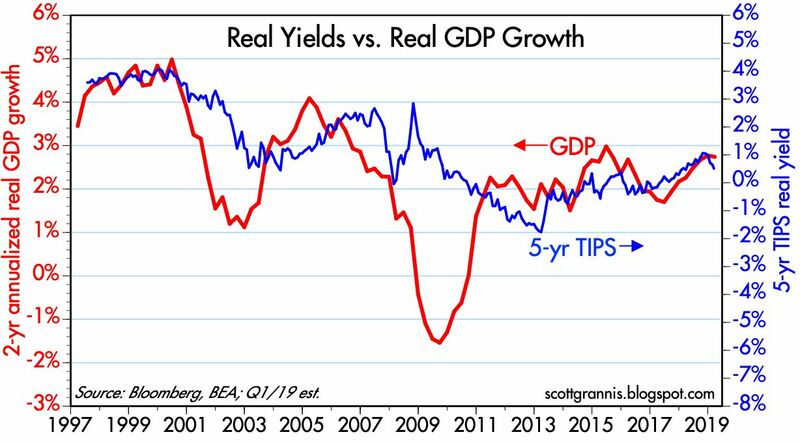 As Chart #8 suggests, this tells us that the market's expectations for economic growth have fallen, since over time the level of real yields tends to track the economy's growth trend. Based on this chart, I estimate the bond market is priced to the expectation that GDP growth will be about 2.5% per year for the foreseeable future. 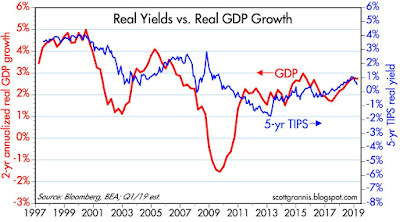 If the market expected 3-4% growth, I would expect to see real yields on 5-yr TIPS trade substantially higher, to 2% or so. Chart #9 compares the market's forecast of what the real Fed funds rate will average over the next 5 years (red line) with the current level of real Fed funds (blue line). Currently these two lines are equal—meaning the front end of the real yield curve is flat. This implies that both the market and the Fed expect inflation to remain anchored at just below 2% (as shown in the green line in Chart #7), and economic growth to remain unremarkable, probably 2.5% or so, for the foreseeable future (as shown in Chart #8). It's a forecast of steady-as-she-goes humdrum, with no need for the Fed to do anything. No surprises, just stable and unremarkable conditions on the horizon. Now, whenever the market decides that the status quo is likely to persist indefinitely, one needs to worry, because lots of things could happen to upset the market's applecart. My money says that the most likely surprise is stronger-than-expected growth. 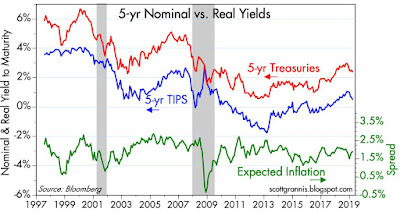 If I'm right, then real rates will need to rise in a manner commensurate with stronger growth. The Fed would need to guide real rates higher, but not by enough to threaten future growth. The thing to worry about is inflation, but for now it appears to be well anchored. No need to fear the Fed for now. 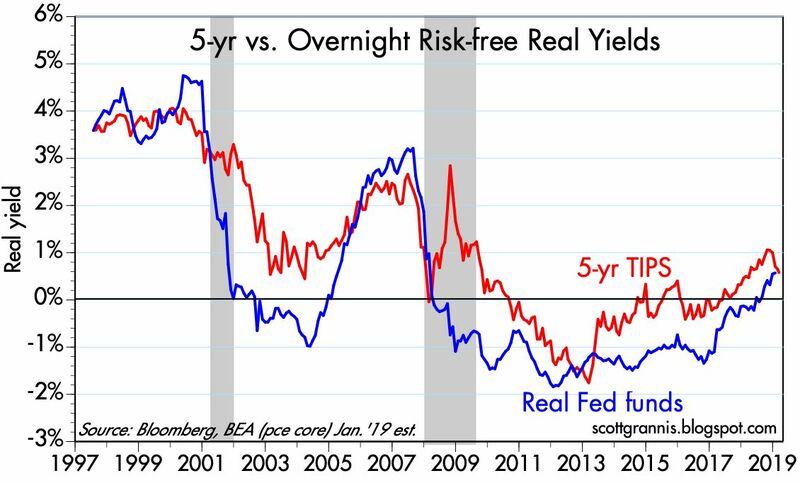 The front end of the yield is flat because the market does not expect the Fed to raise or lower short-term rates. But as Chart #10 shows, the long end of the yield curve has a definite and quite normal upward slope. 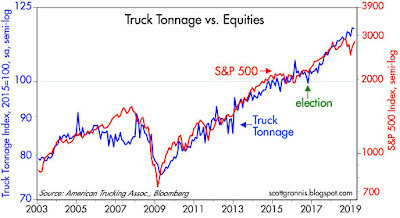 Chart #11 compares an index of truck tonnage to the S&P 500 index. Not surprisingly, the stock market tends to follow the physical expansion and contraction of the economy, as proxied by truck tonnage. Current GDP growth expectations for the first quarter are pretty meager: 0.5 - 1.5%. 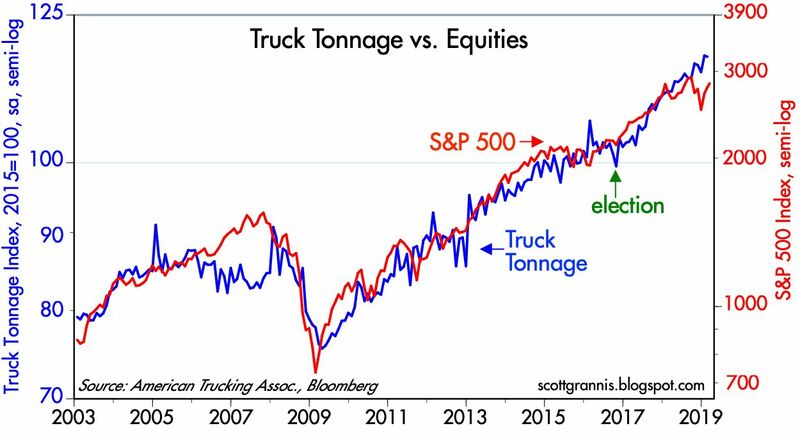 This chart suggests that the stock market may be overly cautious, because truck tonnage has been rising at a 5-6% rate for the past year, and it's up some 18% since the 2016 elections. Swap spreads (see Chart #1) are often good leading indicators of economic and financial market health. 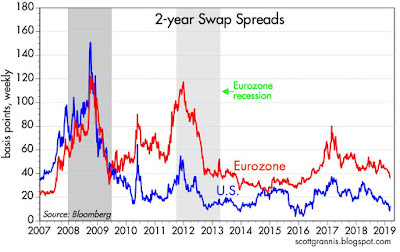 It's worth repeating that Eurozone swap spreads have been tightening of late, which suggests that the Eurozone economy may be ready to pull out of its long slump. 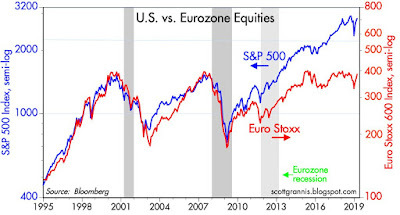 That would be a welcome sign for Eurozone equities, which have fallen far behind their US counterparts, as Chart #12 shows. 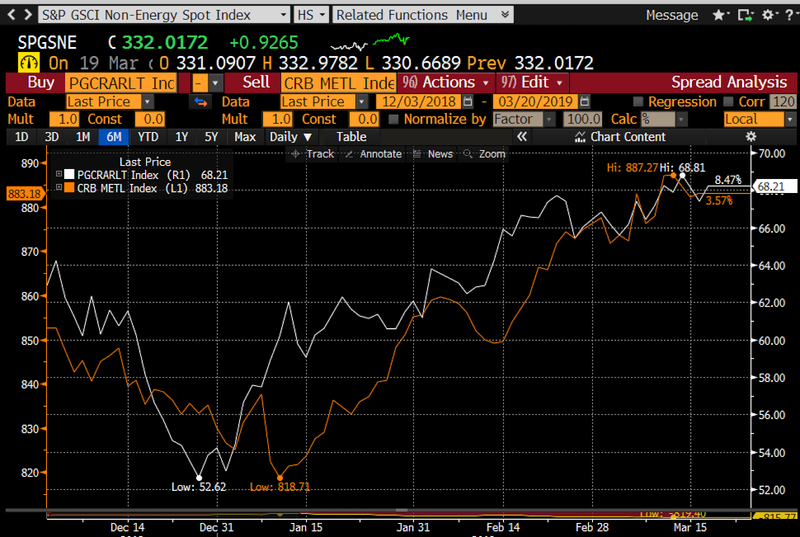 Chart #13 compares an index of industrial metals prices (orange line) with the price of Arab Light crude oil (white line). Both have moved higher since their lows several months ago. Metals prices are up about 8%, and crude oil prices are up almost 30%. That strongly suggests that the global economy is already rebounding from its fourth quarter weakness. Chart #14 shows two measures of the dollar's inflation-adjusted, trade-weighted value. 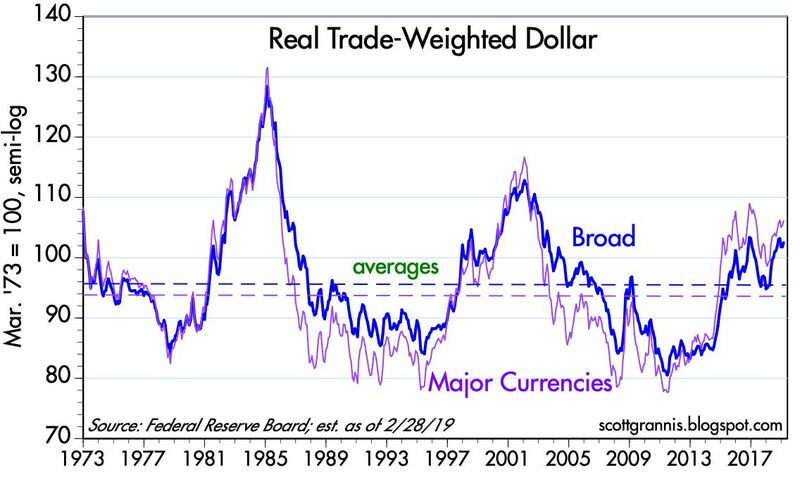 Here we see that the dollar is only about 10% above its long-term average vis a vis other currencies, and it's been around that level for the past several years. 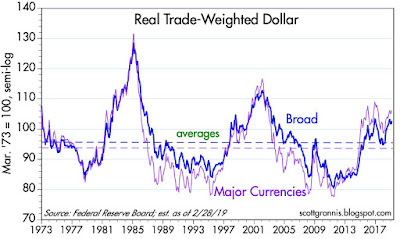 This is very different from the dollar's strength in the mid-1980s and the last 1990s; back then the Fed was actively tightening monetary policy and commodities were very weak. Those were terrible times for most emerging market economies, since they are quite dependent on commodity exports. It's not so bad these days, even though the dollar is relatively strong. 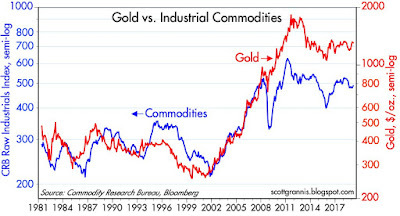 As Chart #15 shows, industrial commodity prices are holding up pretty well, as are gold prices. Another tremendous wrapup of the current economic scene by Scott Grannis. My two cents is that there is still plenty of slack on the sidelines, and the Fed need not worry about inflation. Not only that, as production heats up we will see productivity gains. The amount of goods impacted by a trade war with China is relatively small and really not much of a concern. A larger concern is that is that Red China implodes due to domestic tensions. The Communist Party of China pushing people around, both domestically and globally. "The anomaly is that the U.S. bond market is telling a different story, the opposite story. Real growth expectations embedded in the 10-Year U.S. Treasury bond yield have collapsed 35% (from over 1% to now 0.65%). The bond market is growing extremely pessimistic about the future while the stock market remains optimistic. One of the these markets is wrong. While we currently lean on the side of optimism in agreeing with stocks, now is a time to be extra vigilant protecting downside risk. 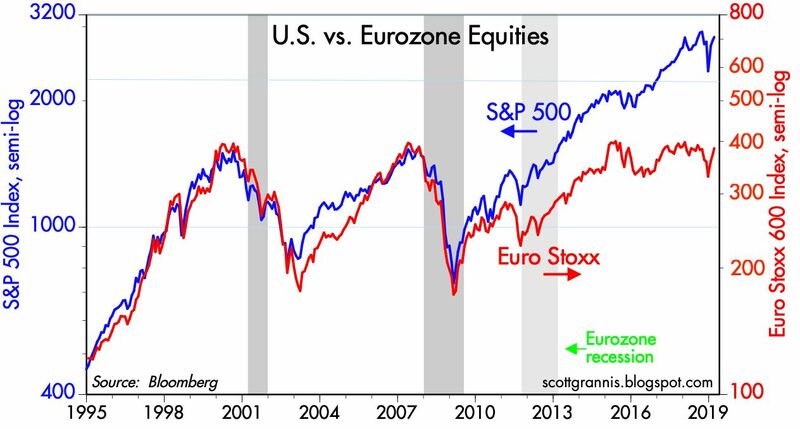 Do not ignore warning signs from one of the largest capital markets on the planet." Any thoughts on that ? Thanks. Nice! !It would be a pleasure if you checked out my blog and helped me with some great and helpful tips. Thank you Scott - great write-up. I would add to the causes of the Dec pullback would be the incessant media push on the recession that is coming which stoked investor fear. They drive off of promoting fear and I do wish it was not so easy to call out the "fake news" when it surfaces. Thanks again for assisting in giving real perspective during these times. Scott: Thanks for the update. I find all the charts to be positive with the exception of Chart #9 (which I'm now treating as a warning). Rob brings up an excellent point and one that I've been wrestling with recently. Just why are bond yields, especially out to ten years, so unrelentingly low? I think it has much to do with Europe but whatever it is it doesn't feel right. Rob, re differences between my views and those of my friend Russell Redenbaugh. I don't think the difference is significant; rather, one of degree. Both of us point out the big decline in real yields, and both of us interpret this to meant that the market's expectations for future GDP growth have declined. I think the decline equates to an expectation of modest (2.5%) real growth, while Russell thinks it means worse. I interpret the decline as evidence of the market's caution, Russell thinks it is more significant. I'm reluctant by nature to say that the equity market can hold a worldview that is different from that of the bond market. I prefer an interpretation that works for both markets. Both of us believe that the market is likely underestimating future growth, and that faster-than-expected growth would result in a significant increase in interest rates. The Fred chart below indicates corp profits continue on their long journey of flat-line stagnation --- i.e., it's curious to look @ the percent change (for corp profit) over the last few decades. Boring! GAAP accounting offers some sad reality to those that feel like we're currently in some amazing period of explosive growth, versus getting a share of normality. Nonetheless, most of these magic "profits" are being pirated-away out the backdoor with excess option grants. In addition, one can learn a fine lesson from the greatest economic genius of all time, Warren Buffett, who along with his fanatical fawners, just gave a nice example of GAAP net income (losses) with Kraft. After all, who has time to follow rules about adjustments for continuing operations and stuff like that -- and why bother fully disclosing multi-billion dollar losses? Even the Treasury ignores GAAP, so one can understand that all these financial things can be confusing ... I digress. brave chicken: the FRED chart you link to is worthless. 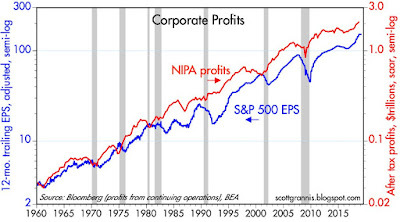 My Chart #3 is a much better representation of the growth of corporate profits. Thank you for the interesting data. At times, the stock market is more about expectations and the bond market, about fundamentals. 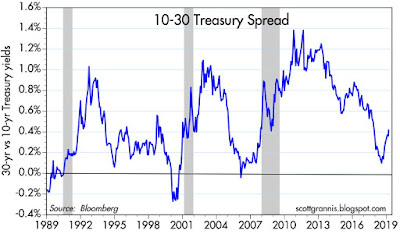 The 30-10 spread recent upward slope is not about a steepening slope of the 10-yr yields having difficulty catching up the rising 30-yr yields, it's about 30-yr yields lagging in catching up the 10-yr yields losing altitude, a typical feature in periods preceding the announcement of further QEs. I respect opinions mentioned but the stock market and other participants do not discount the likelihood that we are getting to flirt again with the zero-bound in a debt-overhanged market. Re (scott): "My Chart #3 is a much better representation of the growth of corporate profits." Perhaps my FRED chart is worthless to you, but if your chart is valuable, then it would be nice to see you reconstruct it with Fed FRED data, i.e., use unbiased data from verified Fed sources (available to anyone). The world is filled with distorted charts and misleading biased hyping information, so if we both use FRED, there must be a way for you to show me why my chart is worthless. Furthermore, FRED provides a vast database of financial information. It would be nice if we could use a common (universal) language (and platform) to debate. Also see this FYI: SEC is cracking down on made-up earnings numbers. By the end of the second quarter, after the SEC started sending comment letters to companies, that percentage remained the same. And it remained that way, at just under 72%, at the end of the third quarter, even after six months of comment letters from the SEC. All told, about 71% of S&P 500 companies used non-GAAP EPS metrics in their earnings reports — numbers that often make it harder for investors to see a clear, consistent picture of the performance of the companies in which they invest. The charts I show in my posts use the very same GDP, BLS, and BEA data that FRED has, and that you suggest. Instead of just showing annual growth rates, it's much better to show profits relative to GDP or profits in inflation-adjusted terms. Profits as a % of GDP shows how profits have been extremely strong from an historical perspective. 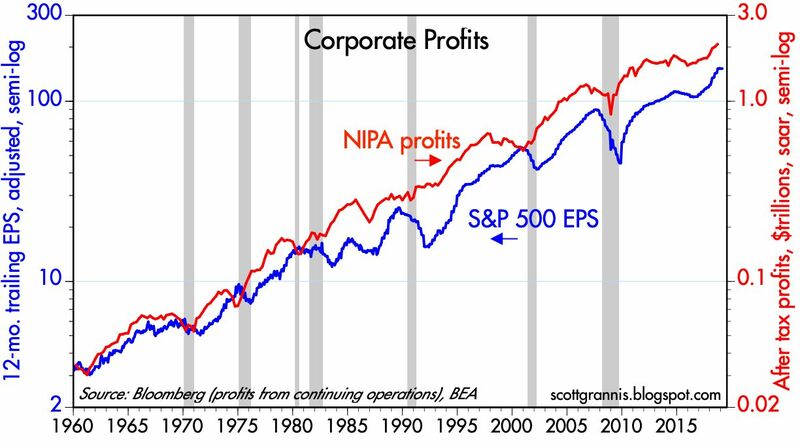 I suggest you look at some of my past posts on corporate profits. Go to the upper left had corner of my blog and search for "corporate profits." Bond traders are by heir very nature far more conservative and frankly pessimistic than stock traders. I have always discounted the differences in smaller divergent moves in these two markets. Now if we see moves like in '99 then for sure we need to worry. Not there yet but today's action didn't help. Really need to see continued buying in stocks and high yield/bank loans sell off concurrently. GAAP net income, is obviously a useful metric for valuations. The recent Warren Buffett screw-up with Kraft stands out as a fine example as to why EPS cookie jar accounting and distorted adjustments fall in-between the fine line of fraud and stupidity. "... The chart, and adjustments, are the handiwork of economist and consultant Arthur Laffer, who contends that price/earnings multiples are as low as they have been in more than 30 years of U.S. booms and busts. 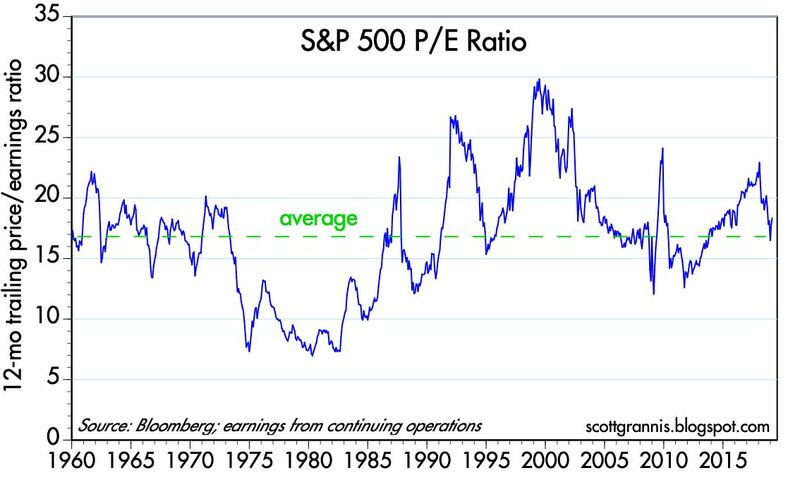 Indeed, as a result of certain adjustments Laffer makes, stocks are trading for only 3.3 times earnings. So after all adjustments, Laffer maintains stock-market valuations, "properly" calculated, are at 34-year lows, not in nosebleed territory, as the bears contend. Ed Yardeni, chief strategist of Prudential Equity Group, professes to be sympathetic to that argument, particularly Laffer's contention that favorable tax changes have yet to be reflected in stock prices. But he could say only "wow" when told Laffer's adjustments reduce the S&P's P/E to 3.3. "This is a brilliant argument, and Laffer certainly has stature as the leading supply-side theorist," he says. "I just worry that his number pushes the bull case too far, and destroys the argument's credibility." ==> My take on this is, corporate profits crashed after 2004 and the Laffer P/e ended up being a poor way to evaluate profit growth, GDP and dynamic economic trends. I'm just searching for ideas -- and many of your Calafia Beach Pundit blogs widen my perspective, so I appreciate this resource! I want to underline that I've followed your blog for a long time and appreciate the inputs. Interesting to look back sometimes to assess underlying assumptions. The first chart is about the gloomy yield curve, which, with the benefit of hindsight, was not gloomy enough. Is the economy about to jump with the release of animal spirits and will long rates soar? Is the yield curve right in predicting that things are about to get sour? With corporate debt to GDP being where it is, one has to hope that the central bank will know what to do but do they? Scott. Thank you for this great post. Quick question: for Chart 10 - 10-30 yr. The slope is sharply up right now which is the same thing that has occurred before the last 3 recessions. Could this be an early warning sign even though everything else (mostly coincident indiactors) look good? bears are growing louder after this most recent 2 10 inversion despite being wrong on the sustainability of this economic expansion for the past ten years - the isi survey and real time metrics are improving and with the fed done for now i think we are setup nicely for positive economic surprises from here - with that said the inversion usually indicates we have hit a peak so i think we are definitely late stage - my biggest current concern is that we have never had an inversion etc with machines running the market - they might make this all self fulfilling like what we saw on friday - the government needs to attack market infrastructure which they have had blinders on - are we really going to let algos run oil prices as an example despite the importance of oil to low end consumers - agree scott? I'm not sure if maybe the impending Mueller report had an effect on Friday's market action but the 10 yr note inverted re the 3 mo bill. While not completely conclusive, it is a serious shot across the bow implying recession in near future. Yes. 3 mo 10 year Treasuries the classic textbook metric for recessions forecasting. Re yield curve inversion. Since I posted this, parts of the yield curve have become inverted, mainly because the market is priced to the (new) expectation that the Fed is likely to cut rates later this year. That in turn implies the market views the economy as weak and likely to get weaker. Thanks to the drumbeat of commentary about how inversions are a sign of impending recession, I'm not ready to make that call. My rationale is that while a yield curve inversion is a necessary condition for an upcoming recession, it is not a sufficient condition. 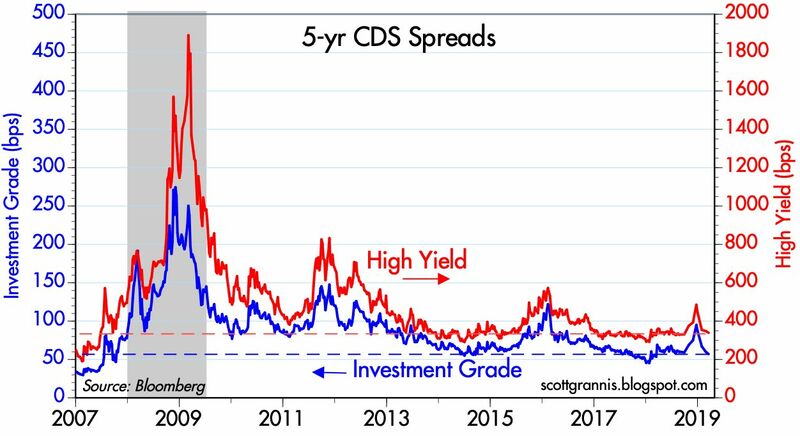 To confidently forecast an impending recession, I think you need to see 1) much higher real interest rates (today they are still very low), and 2) a significant widening of credit spreads, especially swap spreads (credit spreads are still low). So right now we have only one of 3 conditions. 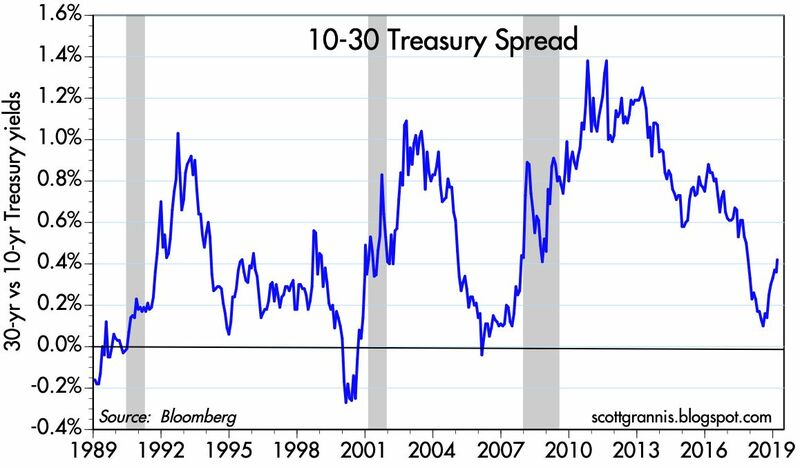 "From an econometric point of view, the 10y Treasury yield less 3m T-bill is the one to watch and puts the next US recession 21 months away. The 10y swap rate less 3m Libor and the 10y – 2y Treasury yield spread put the next US recession 15-17 months away, while the Fed’s near-term forward spread puts it 28 months away." "Re yield curve inversion. Since I posted this, parts of the yield curve have become inverted, mainly because the market is priced to the (new) expectation that the Fed is likely to cut rates later this year. That in turn implies the market views the economy as weak and likely to get weaker. Thanks to the drumbeat of commentary about how inversions are a sign of impending recession, I'm not ready to make that call. My rationale is that while a yield curve inversion is a necessary condition for an upcoming recession, it is not a sufficient condition. To confidently forecast an impending recession, I think you need to see 1) much higher real interest rates (today they are still very low), and 2) a significant widening of credit spreads, especially swap spreads (credit spreads are still low). So right now we have only one of 3 conditions." "What is the relevance of this scenario for today? Although macroeconomic forecasting is fraught with hazards, I would not interpret the currently very flat yield curve as indicating a significant economic slowdown to come, for several reasons. First, in previous episodes when an inverted yield curve was followed by recession, the level of interest rates was quite high, consistent with considerable financial restraint. This time, both short- and long-term interest rates--in nominal and real terms--are relatively low by historical standards.5 Second, as I have already discussed, to the extent that the flattening or inversion of the yield curve is the result of a smaller term premium, the implications for future economic activity are positive rather than negative.6 Finally, the yield curve is only one of the financial indicators that researchers have found useful in predicting swings in economic activity. Other indicators that have had empirical success in the past, including corporate risk spreads, would seem to be consistent with continuing solid economic growth. In that regard, the fact that actual and implied volatilities of most financial prices remain subdued suggests that market participants do not harbor significant reservations about the economic outlook." Scott, isn't the issue with an inverted yield curve that it keeps banks from lending because there's no spread for them to make a profit? This reluctance of banks to lend will dry up the fuel used to grow the economy, resulting in a recession. If that is how it works, what difference does it make if real interest rates are still very low. Thank you. Bernanke's term began February 1, 2006. Bernanke was confirmed for a second term as chairman on January 28, 2010, after being renominated by President Barack Obama, who later referred to him as "the epitome of calm." His second term ended January 31, 2014, when he was succeeded by Janet Yellen on February 3, 2014. See Revision ==> The U.S. economy grew 2.2 percent in the final quarter of last year, the Commerce Department said Thursday, less than the 2.6 percent the government initially estimated and another sign of a slowdown.